Schlumberger Limited CEO Paal Kibsgaard reiterates his macro view on oil prices because the market is playing out exactly as the company expected. The whole world was surprised by the dramatic drop in oil prices over the past year. No one expected oil demand growth to decelerate, which caused an equally unexpected oversupply of oil. However, the subsequent recovery from a market that is oversupplied to one that is more balanced is actually playing out pretty much how oil-field service giant Schlumberger (NYSE:SLB) thought it would. While the overall timing has been pushed back due to a couple of interesting wrinkles, the fact remains that the recovery is following the exact playbook that CEO Paal Kibsgaard has been detailing in his macro market view on the company's conference calls for the past few quarters. I think it's playing out more or less as we have expected globally. I think what you see in OPEC, there is really no change to overall production capacity. There is a continuous shift from spare capacity into marketed supply. The first thing Kibsgaard notes is that OPEC has been using its spare capacity to push more oil onto the market, which is all part of its strategic shift from protecting oil prices to protecting its market share. We can see this shift by looking at the following chart noting the drop in OPEC's spare capacity in 2015. What this shows is OPEC dipping into its reserves, so to speak, to push more oil into the market. This is putting even more downward pressure on oil prices, which then puts pressure on other oil producers to cut their investments. The idea behind this is that the production rate around the world will naturally decline if producers don't keep up investments. That underinvestment will eventually rebalance the oil market without OPEC artificially reducing its output, as it typically does in times of oversupply. In a sense, OPEC's decision to flood the market with oil, while an unexpected wrinkle, is forcing deeper investment cuts from its competitors. It is a plan that is clearly working, according to Kibsgaard: "In North America, the production is coming down more or less as expected as well and internationally, we are starting to see signs of a weakening supply as well." 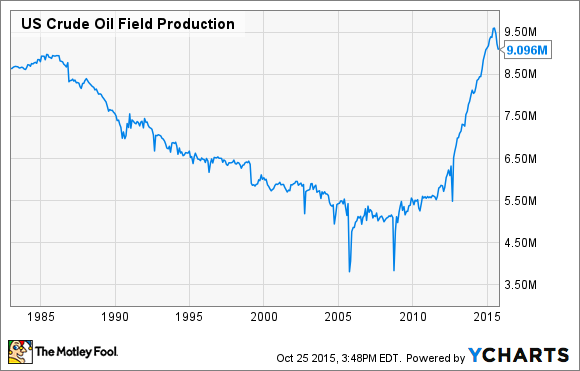 We can see the early signs that U.S. oil production is coming down on the slide below. This decline is expected to continue, with OPEC projecting that U.S. oil production will decline by more than 500,000 barrels per day next year. Furthermore, there are signs on the horizon that oil output globally is poised to fall in places like Canada, Russia, and the North Sea. I think in all these three main sources of supply, while production is starting to come down, I think there are also significant efforts to maximize production within each of these basins, while in some cases taking more short-term actions to maximize production, which might actually have a negative [impact] on long-term recovery. I think there is only a limited period that this can be done, and while the various players exhaust these type of opportunities, if investments aren't increased, I think you will see a further acceleration of the drop in production. Kibsgaard is noting that producers are doing everything they can to boost oil output in the short term at the risk of longer-term investments. For example, ConocoPhillips (NYSE: COP) is cutting long-lead-time projects, including its operated deepwater Gulf of Mexico exploration program as well as new oil sands expansion projects, because these projects won't produce any oil or cash flow for years. In place of these investments, ConocoPhillips and others are favoring projects that will boost oil output and therefore cash flow in the short term, such as those from shale plays like the Eagle Ford and Bakken, where ConocoPhillips' production is up 16% year over year. This focus on generating short-term cash flow is largely due to the need to generate more cash flow to meet current expenses, and the only way to do that, aside from rising oil prices, is to increase volume. The problem with this is it has not only prolonged the downturn, but it's setting up a longer-term supply problem because there is a growing risk that there won't be enough oil supplies coming on line from these larger, longer-term projects to meet growing future demand. Schlumberger CEO Paal Kibsgaard's view on the oil market recovery hasn't changed. In fact, it's playing out exactly as expected. That said, a couple of wrinkles have prolonged its duration, including OPEC marketing more of its spare capacity while other producers, such as ConocoPhillips, are focused on boosting short-term production and cash flow. Even with these wrinkles, a return to balance between supply and demand is on the horizon, and that should lead to an improvement of oil prices. That's great news for an oil company like ConocoPhillips because it suggests its cash flow should head higher, too.